The good news is in for fans of the West Hollywood diner. NORMS La Cienega: It's headed for historic protections, via an unanimous Los Angeles City Council vote. The word arrived on Wednesday, May 20. There's probably no sweeter word beyond "unanimous" to the ears of a preservation-minded building buff who is looking to protect, and save, a storied local structure. That was just the sweet-to-the-ears word that emerged on Wednesday, May 20 from the Los Angeles City Council vote on the fate of NORMS La Cienega. The council voted, unanimously, to make the Armet & Davis-designed diner, a West Hollywood staple since 1957, a Historic-Cultural Monument. 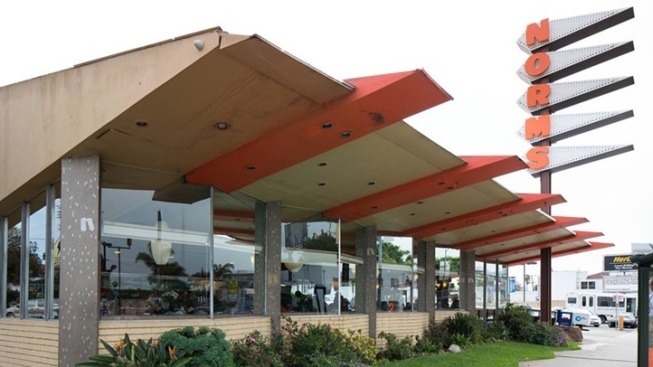 This will "help protect the iconic Googie building from demolition and excessive alterations," says a Facebook post from the Los Angeles Conservancy, one of the preservation groups advocating for the orange-glass-and-rock restaurant. The Conservancy also gave a special shout-out to Councilmember Paul Koretz and "his leadership in this effort." NORMS' recent journey to monumenthood started at the beginning of 2015, when a demolition permit was ordered for the property. An impassioned rally, which included "Mad Men" creator Matt Weiner, followed in front of the diner in late March. The eye-catching eatery will join a sizable score of regional buildings that have received similar protections since The City of Los Angeles Cultural Heritage Ordinance kicked off in 1962. There are "over 1,000 Historic-Cultural Monuments" on the roster, sites considered to be among the area's "most significant and cherished historic resources." Other local Historic-Cultural Monuments from the general era of NORMS include the Cinerama Dome on Sunset Boulevard and Johnie's Coffee Shop at Wilshire Boulevard and Fairfax Avenue. A photo gallery provides a lively look at the gas stations, residences, and office buildings now receiving protections and considerations. You're in good company, NORMS La Cienega. Welcome.